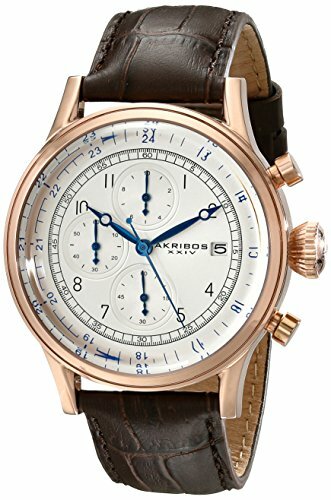 You are just at the right place if you are in search for the best Akribos watches review. If you are on a tight budget and in need of a quality timepiece that is affordable, then this post is for you. Akribos joins the list of the best brand in the watch industry, and it’s increasing in popularity based on its value and service rendered. Akribos are well known for producing imaginative watches that offers you a current experience which won’t affect your budget. Akribos might be ten years and above, but their achievement means they’ve had a significant impact on the industry. Akribos is committed to offering stylish wristwatches that feature classic lines, sleek design and elegant fashion experiences. They produce modern and sophisticated, yet still traditional and understandable as well. If you want something that is smart, stylish and simple to understand, you will find some watches in the collections manufactured by Akribos that are sparkly, fun and trendy. The typical function of a watch is to keep a close tab on time and most comes with two types of displays such as analog and digital. Both have their mode of operation. A watch most features include hour markers, Luminous hands, date and minute timer, tachymeter, sub dial, crystal case for the dial to enhance the durability, and water resistant. It is all about the physical or exterior design of a watch. All that comprises of the design is the band, bezel, dial, crown buckle, chronograph and other parts. The appearance of the watch determines the category it belongs to either formal or casual. The interior part of a watch is complex and can’t be understood by any individual who got no knowledge of the anatomy of a watch. So, therefore it is advisable that you opt for a watch that has manufacturer support scheme or warranty to ensure that you get covered if any fault pops up. Top Akribos watches review you can choose in the market. Choosing the right product might be so confusing to do for you due to your minimal knowledge of wristwatch. It is why I’ve mystified the task for you by selecting the best in the market for you in this post. 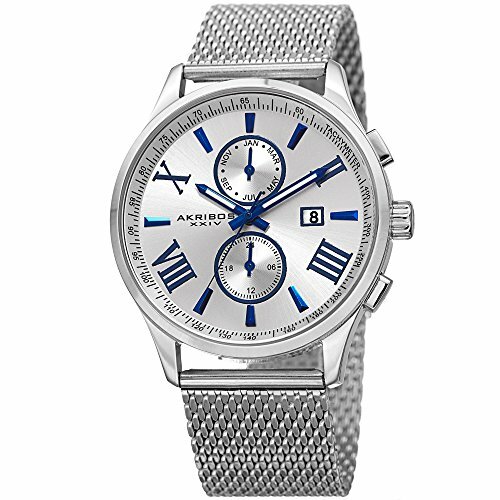 The Men’s Swiss Quartz Multi-function Blue Accented Sunray Dial Silver-tone Mesh Stainless Steel Bracelet Watch with the code AK905SS is a timepiece that has the combination of modern fashion and classic design. The wristwatch is 43 mm in diameter and made comes with stainless steel case which makes it appear with a polished finish. The watch has a stationary bezel, and that is seen just in the case of the wristwatch. It has sloped tachymeter track on the chapter ring. Come to think of the dial of the watch; it is adorned with hand-applied blue Roman numeral and baton markers along with two sub-dial rings. The good part of the watch is that it is powerfully powered by a precision ISA Swiss quartz movement which includes month at 12 o’clock position, date at the 3 o’clock and 24-hour functions. It is capped with alluring stainless steel mesh bracelet that has hook clasp for safety and firmness on your wrist. The watch is a perfect gift for loved ones who cherish stylish wristwatch. The dial and the band color is silver; it has analog display and about 100 feet water resistant recommendation. The dial of the wristwatch has been specially struck hydraulically before embossing, and this is to ensure that the subdials appear to have both depth and dimension. It has a great shape with the help of the mineral crystal casing. The right side of the wristwatch is that the fine mesh bracelet has an adjustable clasp so that the band will fit snugly around your wrist. The hands and hour markers of the watch have luminescent for visibility. The mineral crystal case that has sapphire coating play a major role in keeping the dial safe and secured. It has three subdials display of 30 minutes, 60 seconds, and date. Quality: It is made of durable and strong materials which serve as a protective measure to help prevent damage to the watch. Price: it is fairly inexpensive because some watch is expensive with lesser features. The Men’s AK798RG Rose-Tone Stainless Steel Watch with Brown Leather Band is a quality timepiece with sleek design and stylish look which makes the watch elegant. It has amazing features which make it beat some of the best and expensive wristwatches in competition. The watch appears to be a standard timepiece with 44mm case diameter, and it comes with Gent titanium and stainless steel case. Think of how durable the watch is to combine gents, stainless steel, and titanium which is well known for its solidness and durability. 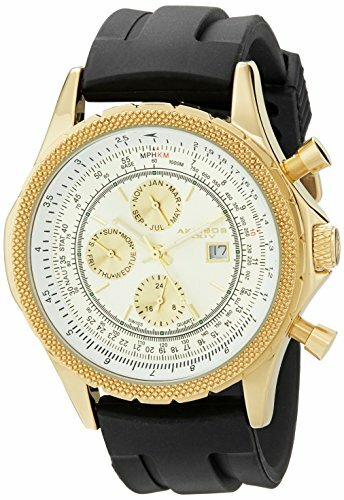 The watch has a gold finish with three-time-zone and JS chronograph movements. It has silicone band made of calfskin leather along with the buckle to keep the watch intact on your wrist. It has a chronographic dial which is white in color and good stainless steel bezel that is stationary, blue hands and genuine brown leather band, analog display and Japanese quartz movement which all makes the watch suitable for different outings. The wristwatch is slightly water resistant which means it can withstand splashes and rain but not submersion above 50 meters. Its calfskin leather is genuine and of greater quality with gold metallic buckle. The dial window of the watch is firmly protected with the mineral crystal. It has a solid design with an attractive body and stylish genuine leather strap. Not suitable for diving or any other water sports or activity. Quality: The quality of this watch is of a higher standard. It is made with great materials to ensure it meets the need of everyone out there. Design: It has alluring design, and that makes it perfect for casual and formal outings with the combination of its metallic dial and leather strap. Price: fairly expensive due to it stylish and classy design. 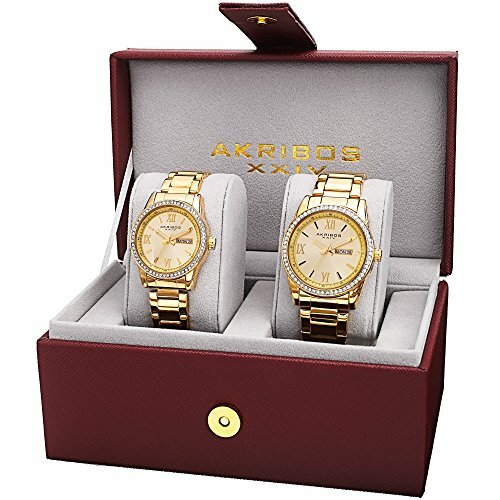 The Men’s and Women’s AK888YG Watch with Yellow Gold Dial and Bracelet Ensemble Set is a wonderful piece for couples out there in search for the best twin watches in the market. Not all brands come up with the idea of producing twin wristwatch and the demand for it is on the rise today. It is the main reason akribos decides to come up with one that can be used by couples. It can be a perfect gift for a birthday, or you can choose as part of your wedding adornment, and you will be glad for the deal. It comes in a box where the two watches are wrapped in a foam. The watch appears to be made of gold with its blistering appearance which makes it irresistible for watch lovers. 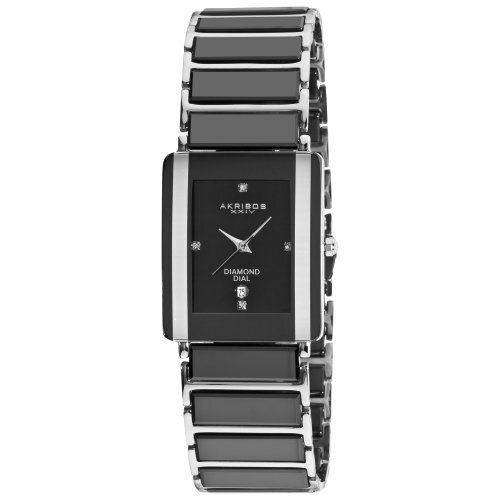 The crystal accented bracelet watch operates with quartz movement. The case of the watch is 41 mm in diameter; the case is made of stainless steel, the band is also made of stainless steel. The bezel of the watch is stationary and made of stainless steel; the band comes in a gold color as the same with the dial of the watch. The crown also comes with gold color but made of stainless steel, and it can be used to control the hand and minute of the watch by removing the crown and move in clockwise direction. The date and day window located at three o’ clock position and that can as well be controlled with the crown in place by moving in the anti-clockwise direction. The twin watch has quartz movement, analog display, the dial window is made of mineral, it has a push-button clasp to ensure its safety. Quality: It is made of lasting and durable materials to meet every one need out there. Design: It is designed for those who love Gold wristwatch, especially for couples. It has a simple design with the attractive look and amazing features such as the numbers which are written in Roman numerals to mention a few. Price: It is fairly inexpensive compared to some expensive brands in the market. 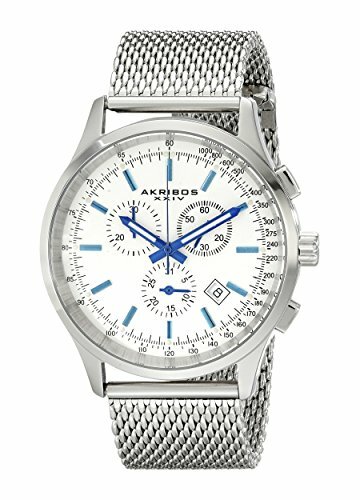 The Men’s AK625SS Round Silver Dial Chronograph Quartz Stainless Steel Bracelet Watch is the next on the list of the top akribos watches review in this post. The wristwatch is an emblem of classy design with a sports appearance. It is made for men who loves classic wristwatch and hold smartness and durability on the priority list. The wristwatch is a standard timepiece which features a 42.5mm case steel that is made of solid stainless steel. The watch has polished beveled bezel frame that is stationary along with a white dial and operates in conformation to ISA Swiss quartz. It has chronograph movement which includes chronograph seconds, small seconds, 30 minutes counter, and two dates incorporated. It has stainless steel bracelet mesh bracelet; the dial window is made of mineral crystal to protect the dial. It has an analog display, it has Swiss quartz movement, band and dial are silver in color, and the stationary bezel is made of stainless steel. The silver color dial with chronograph feature, tachymeter scale and date display window located at the 4.5 position and it has water resistant up to about 165 feet. It is made of the durable bracelet and buckles to hold the watch on your wrist. Quality: It is made of amazing quality materials which makes it durable and strong to handle any rigor of the day. Design: Individually hand of the watch has blued baton style hour markers with a luminescent filled blued hour and minute hands for more visibility. Made with stainless steel case, stainless steel fine mesh bracelet and EZ adjust sliding buckle to stay firmly on your wrist. The Men’s AK532YG Conqueror Swiss Multifunction Rubber Strap Watch is a sophisticated wristwatch in appearance, and it has lots of features which you need to know about before making any purchase. It is a glamorous wristwatch with multiple functions and features which makes it classy and stylish. It has a shade of black and gold with a black strap that is well made of silicon rubber contrasts and gold metallic dial case. It appears with champagne color Sunday style dial and bright gold hands that will appear clearer in the dark just as if it is in the day and the subdials have a gold tone. The case and the bezel of the watch are made of steel, the bezel is stationary, and the lug of the watch hold the band to ensure it is firmly in place. It has three sub dials which feature the dual time, day and month. The date window is located at 3 o’clock position, the days of the week dial at 9 o’clock position and the month dial at 12 o’clock position. The black silicon rubber strap has a pocket to hold the band and buckle to help hold the watch. It is a versatile watch with quality features. It works beyond checking the time as it adds to your fashion sense and style. Price: It is fairly expensive but worth every penny spent on it considering the amazing features it has. The Men’s AK521BK Ceramic Rectangular Quartz Bracelet Watch is the next on the list, and it comes with a different design from those I’ve reviewed in this article. The wristwatch comes in a rectangular shape, and its operation type is analog. Its design is quite pleasing to the eye, and that makes it so difficult to resist. The watch has dial window made of mineral crystal for protection, it has an analog display, and jewelry clasp and the band is made of a solid material known as ceramic. The band color and dial come in black, and the stationary bezel is stationary while the clock operates on Japanese quartz movement. The watch has four genuine diamonds at 12, 9, 6 and 3 o’clock. Design: It is designed to meet the need of those who don’t love round shape watch. Price: It is cost effective. 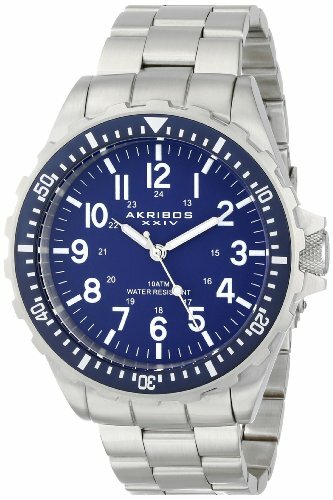 The Men’s AK689BU Essential Quartz Blue Dial Stainless Steel Bracelet Watch is second to the last on the list of the top akribos watches to consider in the market today. The watch has a round shape, and the dial is blue, it has contrast Arabic numeral hour markers with silver tone luminous hands for more visibility in the dark and rotating gear-edge bezel along with seconds marked. The wristwatch has 50 mm stainless steel case with mi real dial window. It operates with quartz movement and has an analog display. The bracelet has three links with fold over clasp and double button safety. It has the crown of the watch secured as it is the main device you can only control the watch with. Quality: It is designed with high-quality materials. 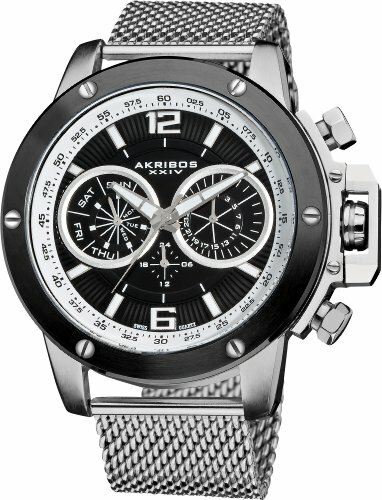 The Men’s Conqueror Swiss Multifunction Silver-tone Stainless Steel Mesh Bracelet Watch is the last on the list of the best akribos watches review here in this post. The wristwatch is manufactured with stainless steel, and so it comes with a stainless steel mesh bracelet. It has on it fixed or stationary black ion-plated bezel. The dial has white markings with silver-tone hands and index hour markers. The design of the watch makes it have minute markers around the outer rim of the watch, and the Arabic numerals mark the 6 and 12 o’clock positions. It has an analog display and with luminescent hands and markers for more visibility with three multifunctional subdials showing 24 hours, days of the week and the exact date. It has Swiss quartz movement, and the dial is covered or protected with scratch resistant mineral crystal. The case of the watch is screwed down with a quality knot, and it has pull/push crown that is secured by the guard. Quality: It is made of high-quality materials to ensure it meets every need and last longer. Design: The watch Features mesh bracelet, deployment clasp closure, outer minute track, luminous hands and Water resistant to 330 feet which makes it ideal for water sporting activities. Price: It is affordable and cost effective considering the quality and features, it is a perfect deal. 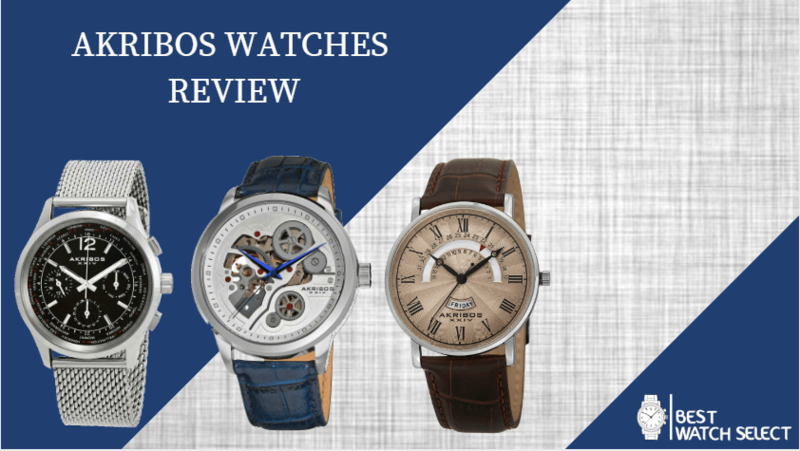 Here is the perfect place to be for those who keep searching for Akribos watches review. We really hope we did justice and meet your need with this article.